I needed some good nonfiction, I’m interested in the subject of the Weather Underground and other radical groups of the 1970s, and this is a brand new look back. It’s certainly comprehensive although from what I read there are entirely too many sources which are labeled as “anonymous.” Also unfortunately, there’s virtually nothing about what was actually in the voluminous tracts the groups themselves wrote – what they said about the wrongs they were trying to correct, what they said about themselves at the time. I knew quite a lot about the subject because I followed the events fairly closely back in the days. But my anecdotal experience, based entirely on frustration with the peaceful protests of the student anti-war movement’s lack of progress, is a far cry from the complexities of the whole. 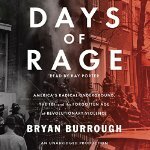 I would have closed the book at about the third chapter because it seemed to me that Burroughs had a definite political agenda bent on showing the worst of these people, (without mentioning their causes) some of whom I consider heroes. Warning – this attitude continues throughout the entire book, even if he does show a few foibles of the FBI – not much mention of Kent State and the Pentegon incident in which peaceful protesters were shot at). In the Epilogue where he reviews what these folks have done in the past 25-30 years – he sounds a bit annoyed they weren’t all executed. For what it’s worth, the author was recently interviewed on the FOX as well as NPR networks. Still – I’m glad I finished. It was good to remember some things or learn about some aspects. It’s a very well-written book of the true-crime genre – often page-turning as the chases and the hiding go on. The narrator, Ray Porter, adds to the suspense and tone of the book.